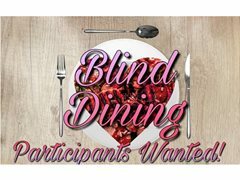 I am directing a 3 episode series called Blind Dining - It’s basically a copy of dinner date. We need 1 girl to be our main contestant! •	One girl picks three (of five) favourite menus put together by five different guys. •	The girl then goes on three individual dinner dates with the three guys behind the selected menus, which involves them cooking the meal and trying to impress the main contestant over a romantic meal that they host. •	The main contestant then picks a favourite out of the three and the are treated to a meal out that they didn’t have to cook. We want to start filming ASAP! We will work around you. No acting necessary! Just be yourself (unless you want to act), it's a reality TV show. We will only need you for 4 evenings (or in the day if you can't do evenings), whenever you're free before the 7th December (the filming cut off point).